It also describes enhanced web security features designed to protect you, such as HTTPS, and it’s No Advertising policy. The holding and use of your personal information comply with the Data Protection Act. It is also compliant with the GDPR (General Data Protection Regulation) which came into force on 25 May 2018. Regular reviews will ensure ongoing compliance with this. The GDPR applies throughout the European Union (EU). It strengthens, harmonises, and modernises EU data protection law and enhances individual rights and freedoms. It is consistent with the European understanding that privacy is a fundamental human right. 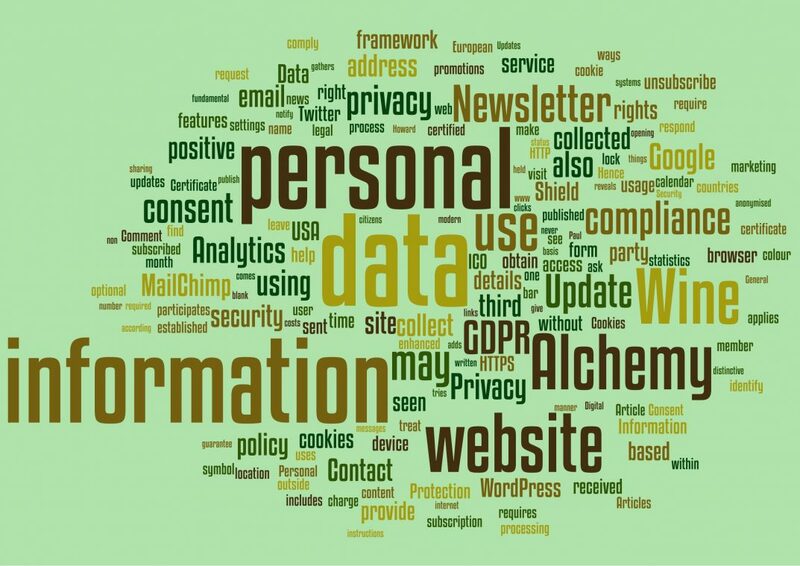 The GDPR regulates how individuals and organisations may obtain, use, store, and destroy your personal data. The GDPR covers all institutions established in the EU. It also includes all systems outside the EU that process the personal data of EU citizens. The penalties for non-compliance are stringent. Wine Alchemy, established in the UK, is the Data Controller. Paul Howard, Owner and Director, is the Data Protection Officer. Contact him via the website. The Wine Alchemy ICO registration at the ICO (Information Commissioners’ Office) is ZA317200. The ICO is the regulator. They provide details about your personal data rights and data security. In addition, they monitor and investigate data breaches and complaints. When you visit www.winealchemy.co.uk, we use a third-party service, Google Analytics, based in the USA. They collect standard internet log information and details of visitor behaviour patterns. We do this to find out things such as the number of visitors to the various parts of the site. This information is only processed anonymously, which does not identify anyone. Neither ourselves or Google Analytics tries to find out the identities of those browsing our website. Google Analytics participates in and has certified its compliance with the Privacy Shield framework. They treat all personal data received from EU member countries under the Privacy Shield framework. Further details about Google Analytics compliance can be seen here. The Wine Alchemy site features an embedded Twitter feed. Twitter is based in the USA; their policy can be seen here. There is no sharing of your personal data on Twitter or any other Social Media. Digital Information is usually sent from your access device to the website. This is about the device, its location and IP address. Wine Alchemy does not and will never collect Sensitive personal data. Examples include health or financial information or information that reveals a person’s racial or ethnic origin. Wine Alchemy does not conduct personal data Profiling. Hence by using the Wine Alchemy website, you agree to cookie use. If you do not accept this, you can alter your own browser settings. You can turn off cookies or block those which are unacceptable to you. You can also delete existing cookies. All modern browsers allow you to do this and your browser settings have instructions on this. 6) How do we use the information you provide? provide anonymised usage statistics using Google Analytics. We do not sell personal information collected by the website to any third party. The transfer of personal data for data processing is to Google Analytics, WordPress or MailChimp. These third-party data processors are outside the EU as described above. Notwithstanding this, we are under a duty to disclose or share your information to comply with any legal obligations. Consent is the legal basis for processing your personal data according to the GDPR. The Wine Alchemy Newsletter/Update subscription, Contact Me form and Article Comment are optional. Their use requires your positive consent to collect and use your personal data. You may sign up for the Newsletter/Update, use the Contact Me form or leave Comments on published Articles. You must positively give your consent to each of these. This is by ticking a blank consent box for every use. The Newsletter/Update is an optional free subscription service which requires your positive consent when first signing up. You may unsubscribe from this subscribed Newsletter/Update service at any time. All Newsletter/Updates sent contain automatic unsubscribe links. Wine Alchemy deems a subscriber as inactive when they do not open a Newsletter/Update for two years. Hence in such cases, the person will be unsubscribed. You can refuse consent without detriment. The Newsletter/Update is constructed, sent and analysed by MailChimp. MailChimp is a data processor in the USA. It gathers statistics on email opening, location and clicks using their technologies. MailChimp participates in and has certified its compliance with the Privacy Shield framework. They treat all personal data received from EU member countries under the Privacy Shield framework. Further details on MailChimp’s compliance can be seen here. You may request access to your personal data that we collect online and maintain by contacting us at any time. This is without charge. Exceptionally, we may charge a fee based on our administrative costs. This is when the application is unfounded, excessive, or repetitive. We will respond within one calendar month of the request date. You have the right to ask us not to process information for marketing purposes. Any marketing will cease immediately upon receipt. You have the right to have any of your personal data held by us securely erased, restricted or rectified. We will respond without undue delay, and in any case within one calendar month. You may unsubscribe from a subscribed Newsletter/Update at any time. A lock symbol in the address bar. It varies in colour depending on the website security status. By clicking on the lock symbol, you can obtain more information about the EV certificate. Browsers such as Google Chrome now display HTTP sites as Not Secure. HTTPS is much more secure than HTTP. However, we cannot guarantee the security of your data during transit to our website. Once we have received it, we use security features to prevent unauthorised access. Wine Alchemy has never accepted offers to include advertising of third-party goods and services. Advertising requests are always politely declined. Wine Alchemy also refuses to feature sponsored links (aka”Clickbait”). It believes that people visiting the website are there to explore its own published content. Hence this should be without distraction or for use as a portal to junk or fake journalism. External links included in articles are to inform or provide further exploration. In such cases, they are to websites deemed to provide relevant and legitimate content. Wine Alchemy does not accept monetary inducements for any recommendations made. Recommendations are based on merit and personal opinion and without guarantee.